Laptops make it easy to take your work on the go, but using your laptop isn’t always so comfortable. The MOFT stand is a game-changer that provides the convenience of a mobile stand in a lightweight and dependable design. The MOFT stand unobtrusively adheres to the bottom of your laptop. When you want to work the stand easily unfolds to lift and elevate your laptop for comfortable use. Built-in magnets secure the MOFT stand into position, and quickly release allowing the stand fold flush against your laptop when you are done working. The MOFT stand boasts two elevation settings for customized use. 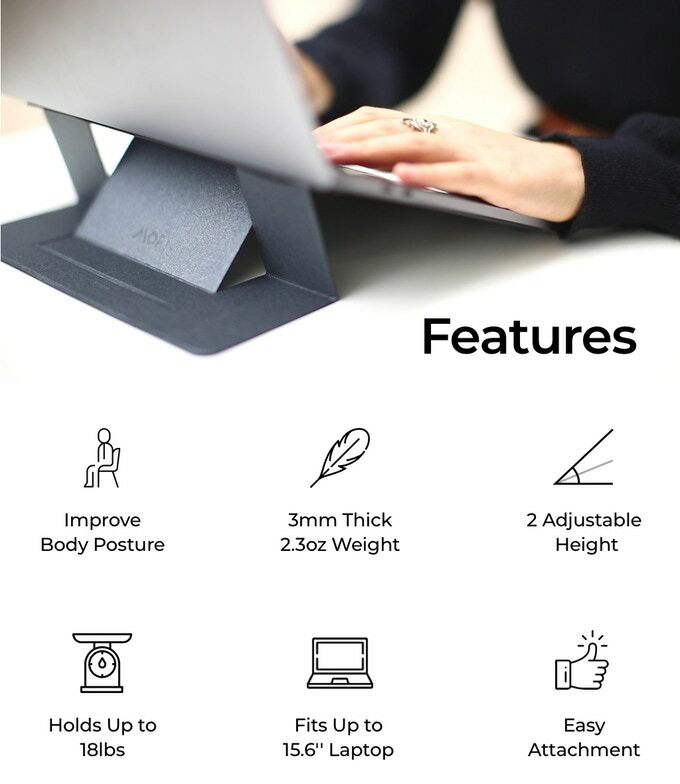 The low-lift setting raises the laptop at a 15-degree angle which elevates the display 2 inches to ease stress and tension on wrists while typing. The high-lift setting places the laptop at a 25-degree angle which raises the display 3 inches to ease neck and shoulder pain while improving posture. The thin and compact design of the MOFT stand doesn’t add any bulk or significant weight to your laptop. Made from PU and fiber glass material, the stand weighs in at 2.3 ounces and is only 1/9 inch thick, so you can still slip your laptop into a carrying case and use it as you normally would. 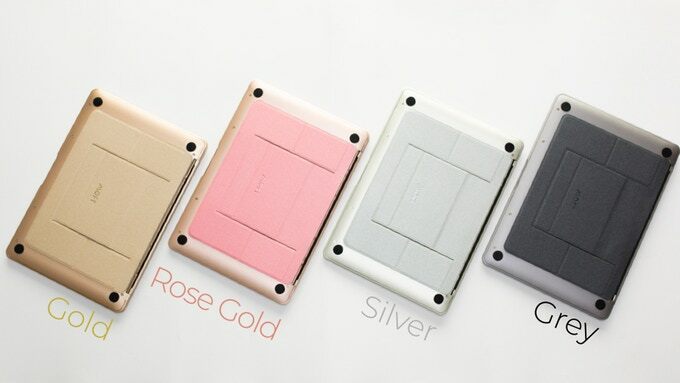 Four colors let you pick the best option to blend into your laptop. The stand adheres to the bottom of most laptops with displays up to 15.6 inches and supports up to 18 pounds. Since the stand is always attached to your laptop it eliminates the need to carry a separate stand. The MOFT stand can easily be removed in order to adjust and apply to another device without leaving any residue on your laptop. The MOFT stand will be available on kickstarter until the beginning of march!